MSGC's annual Scholarship and Fellowship Competitions are awards for the ensuing academic year. Awards are normally made to select students enrolled at MSGC campuses in disciplines related to Science, Math, Engineering, Technology or other areas of interest to NASA. The awards are tiered with the potential for automatic renewal. 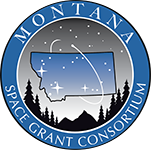 The Montana Space Grant Consortium offers undergraduate scholarships of for the academic year. Awards are made on a competitive basis to students enrolled in fields of study relevant to NASA's mission. These fields include (but are not necessarily limited to): the Biological and Life Sciences, Chemistry, Geological and Planetary Sciences, Physics and Astronomy, Mathematics, Mechanical Engineering, Chemical Engineering, Electrical Engineering, Computer Engineering, Computer Sciences, and Civil Engineering. Applications are due each year on October 1st for two year institutions. Affilate Representative information is listed on the MSGC Members page. Note: Bitterroot College students you fall under the UM umbrella and are recommended to contact the Missoula College affiliate representative.